Pentatonic scales have five notes – two of the notes in the ordinary scale are missed out. 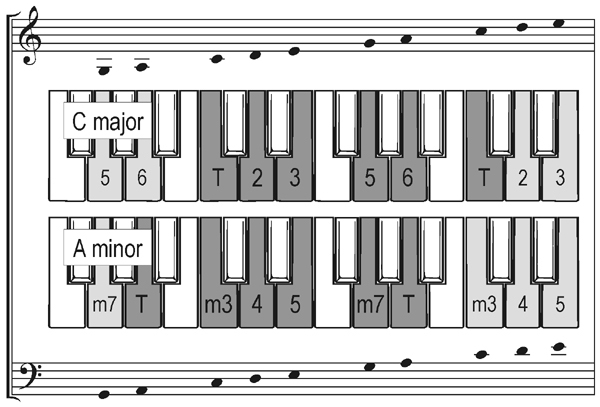 There are two pentatonic scales, a pentatonic major and a pentatonic minor. These scales are easy to learn and generate lots of music, from heavy metal through mainstream rock jamming to folk tunes. Pentatonic scales are great for improvising because they provide a limited set of notes which sound good over a maximum number of chords. Because there are only five of them, it’s easier to pick a note, and it’s more likely to be a good one. If you're interested in boosting your popular-styles keyboard skills using this approach, please watch this introductory video. Here's some sample content from the very first module of the Musicarta Pentatonics Workbook. Using the Pentatonic Workbook keyboard diagrams, you can immediately start picking out pentatonic melodies at the keyboard. ‘Doodle’ with both hands covering a total of perhaps eight or nine notes - the shaded octave and a couple of notes either side. Start and end on your ‘T’ note (for tonic, explained below). You're sure to find the sound is familiar! Here are some sample ‘doodles’. They both start and end on the tonic (name-note). They're right in the middle of the keyboard - try to copy them. There's a whole section of playing-by-ear coaching further on in the Workbook, so don't be dismayed if at first you don't succeed! Feel free to browse more sample content on Sample Page Two.